Kathy and I drove to Wisconsin last weekend to visit her father. We knew the drive was long--more than seven hours--so we didn't want to stop very long for dinner. As much as Kathy hates fast food, we decided to expedite the trip and stop at the Hardee's restaurant in Hinckley, Minnesota. Among other things, I ordered some onion rings, and they were the first item to be delivered. As we stood in the restaurant waiting for the rest of our order to be filled, I reached inside the box and pulled out an onion ring. I'd never seen an onion ring like this: it had a bridge of batter on the inside. I'm a firm believer that things happen for a reason. Anyone who has read my book Answers Within will tell you that I love to find spiritual metaphors in everything around me. The Universe is sending us messages all the time, disguised as ordinary things; we just need to pay attention to the signs. So when I looked at this odd onion ring, I immediately thought that it resembled the Greek letter Theta. That made me think of Theta brain waves, which signify the bridge between sleeping and waking. Often, out-of-body experiences occur during Theta sleep. Was the Universe telling me something? Perhaps to focus more on my theta brain waves? But maybe it wasn't a Theta after all. 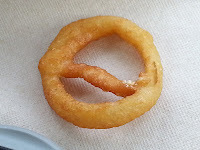 It seemed to me that the onion ring also looked kind of like the Greek letter Omega, in lower case. In the Bible, Revelation 1:8, God reportedly said, "I am the Alpha and Omega, the beginning and the ending" so maybe this was a message from God: We are infinite beings, and we can stretch our consciousness to infinity. I pondered all these deep thoughts, then I pointed to the onion ring and said, "Hey, look at this onion ring!" Kathy saw the ordinary object with an unusual feature. "So?" The cashier gave a bubbly laugh and said, "That's a 'Do Not' symbol! You know: a circle with a diagonal slash through it." Realizing the negativity she was implying, she added, "It means 'Do not leave the store without eating it!'" and we all laughed. I pondered how remarkable it was that we can all see the same things, and yet interpret them different ways. I chose to see the OBE potential, the spiritual--even God--in that simple onion ring. Kathy chose to see the ordinary; the food. The cashier chose to see a message of negativity, and then she had to release everyone from her negativity. As the metal band Savatage puts it, you "see what you want to see". You do it all throughout your life. You can choose to see the negative, the positive, or even the sacred in all things. And all those thoughts will draw you to negative, positive or even sacred experiences. I just finished reading the book Less Incomplete: A Guide to Experiencing The Human Condition Beyond the Physical Body by Sandie Gustus, and wanted to share my thoughts. Sandie Gustus is another instructor and proponent of the IAC, the International Academy of Consciousness, which is a non-profit organization based on the work of Waldo Vieira. The IAC teaches out-of-body experiences and explorations of consciousness. They approach this as scientifically as they can, preferring to call them "projectiology" and "conscientiology" respectively. As I was reading the first half of the book, it struck me as too much like Luis Minero's book, Demystifying the Out-of-Body Experience, but as I got deeper into the book, I revised my thinking. Yes, Gustus comes from the same perspective as Minero, but it's much more personable. Minero's book reads like a text book, with lots of new off-putting terminology (the information, however, is good). Gustus's book only uses the new IAC terminology sparingly, and subtly (and I was grateful for that). In my opinion, it's a bit easier to read for that reason. And it's very well written. She's a good writer. Again, this is my opinion only: Like Minero's book, this one spends way too much time on peripheral topics: intrusion, bioenergy, karma, reincarnation, precognition, retrocognition, past lives, the evolution of consciousness, life plans, holomaturity (basically, ethics), and so forth. She even talks about finding your life's purpose. Yes, the information is good. Yes, it's important, but when you buy an OBE book, you want to read about OBEs, not other topics. I kept reading and reading, waiting for her to "get to the good stuff" but it took a very long time to get there. Maybe I was just impatient because I had recently read Minero's book and he had covered a lot of the same topics. That's not to say there wasn't good OBE-related content. She had good information on the non-physical bodies, non-physical beings, and the importance of energy work. She definitely filled in some blanks left by Minero's book, such as preparing for an OBE, places that you shouldn't visit out-of-body, beings you should not approach while out-of-body, and such. Gustus also gives some solid projection techniques, but in my opinion, she could have had a lot more. It was all pretty basic stuff. She did, however, have a lot of good common-sense tips above and beyond those in Minero's book. One thing I found disappointing was the lack of personal point-of-view. It's clear from Minero's book that he's had many out-of-body experiences and he even shares some of them, which gives his book a certain feeling of authenticity. With Gustus's book, there are no personal OBE stories, and no personal perspective, so I didn't feel "close" to the author as a fellow experiencer. I was left wondering if she even did OBEs herself, or if she was just teaching them (i.e. if it was all "book learning"). In my opinion, a more personal perspective would have made the book better. Full disclosure: I've never taken a class from Gustus, Minero, or the IAC. People who have would likely gain that personal perspective, and not share my disappointment. I'd have to say: yes, this is a good book. It's certainly better than many I've read. It's more "user friendly" than Minero's book (which is also good), but in my opinion, both spend way too much time on side-topics. It's good to get the IAC perspective and approach to out-of-body experiences. The average reader probably doesn't need to read both books, since a lot of the material is similar. At this point, it would be hard to choose which one is better. Minero's book has more information and good solid references to back up his statements. Gustus's book is easier to read and doesn't get bogged down in terminology. Pick one. Flip a coin, or whatever you have to do, but read at least one of them. Or, if you're a fanatic like me, read them both!